I originally learned about the SmartBird drone from the TEDblog. They always have interesting stories that relate to their talks, either directly or indirectly. 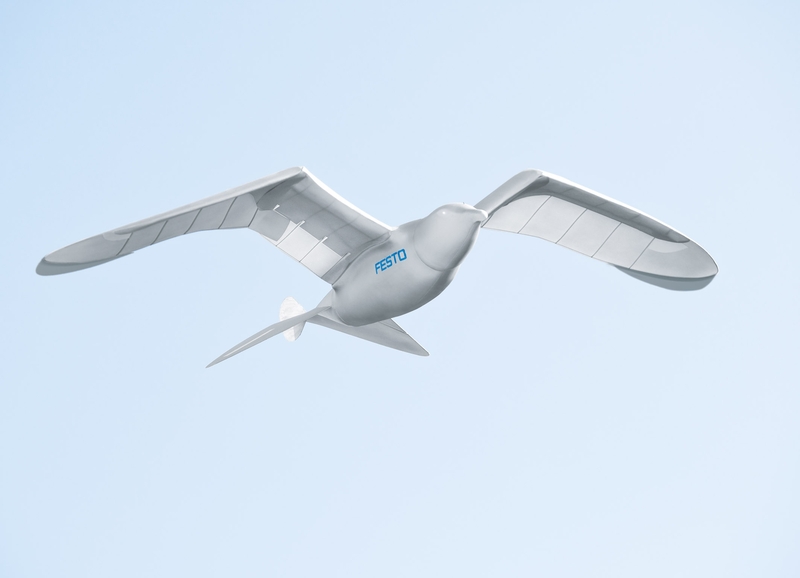 The SmartBird drone, created by Festo, was inspired by the herring gull. The SmartBird drone reproduces “bird flight” and from a distance, I think you’d be hard pressed to pick a fake bird out of a flock of seagulls. For the SmartBird, Festo was inspired by the herring gull. The ultralight flying model impresses with its outstanding aerodynamics and maximum agility and is able to take off, fly and land without an additional drive. In doing so, its wings not only beat up and down, but twist in a specific manner. This is done using an active articulated torsion drive, which provides both lift and propulsion. With this functional integration, Festo has technically deciphered bird flight. What do you do with a giant robot seagull? Fly it into a flock of real seagulls, obviously. This video was shot by Flickr user ldrose two hours after the live demo of SmartBird inside the auditorium at TEDGlobal. Festo engineers brought the bird outside to Holyrood Park, in central Edinburgh, and sent it up into the sky. Eyewitnesses tell us that, almost immediately, out of an empty sky, SmartBird was swarmed by seagulls, dozens of them, each taking a turn to dive at the giant bird. Watching the video and reading the eyewitness comments, it seems clear that the bird perceived SmartBird as a threat. However, for Festo, SmartBird is old news. They are working on bigger and better things, such as eMotionSpheres, collision-free motion of autonomous systems in a space. Festo is definitely an interesting company to keep an eye on. Festo is an independent company in its third generation of family ownership is a worldwide leader in automation and a world market leader in industrial training and development. A total of 17,800 employees in 61 national subsidiaries look after customers in 176 countries and pursue a common goal: the maximum productivity and competitiveness of our customers in factory and process automation.